The Knowledge Consistency Checker (KCC) is a component that automatically generates and maintains the intra-site and inter-site replication topology. You can disable the KCC's automatic generation of intra-site or inter-site topology management, or both. 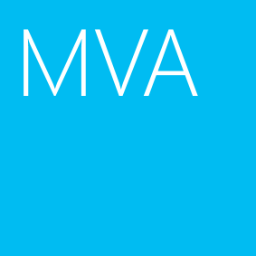 At Windows Server 2003 domain controller, you have to install the support tools kit. 1. At DC11, log in as Domain Administrator. By default, KCC's automatic generation was enabled. Now, intra-site automatic generation of HKG was disabled. Remark: "repadmin /siteoptions /site:HKG +IS_AUTO_TOPOLOGY_DISABLED" affects all domain controllers in HKG site. 1. Still in DC11, launch "Active Directory Sites and Services". 2. Expand "Sites > HKG > Servers > DC11 > NTDS Settings". 3. At right pane, delete "<automatically generated>". 4. Go to "Command Prompt", enter "repadmin /kcc %computername%". "repadmin /kcc" is applied to force the Knowledge Consistency Checker (KCC) on each targeted domain controller to immediately recalculate the inbound replication topology. 5. 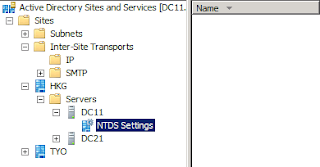 Back to "Active Directory Sites and Services", refresh "NTDS Settings" of DC11. KCC doesn't generate the intra-site connection in DC11. 6. 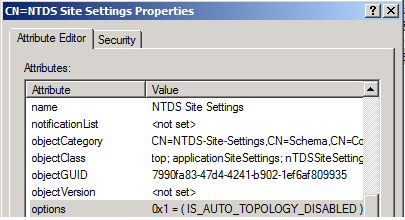 To restore the setting, go to "Command Prompt", enter "repadmin /siteoptions /site:HKG -IS_AUTO_TOPOLOGY_DISABLED". 7. Enter "repadmin /kcc %computername%". 8. 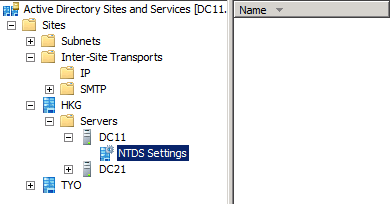 Back to "Active Directory Sites and Services", refresh "NTDS Settings" of DC11. As a result, the intra-site automatic generation of HKG was enabled. 1. At DC02, log in as Domain Administrator. Now, inter-site automatic generation of TYO was disabled. Remark: "repadmin /siteoptions /site:TYO +IS_INTER_SITE_AUTO_TOPOLOGY_DISABLED" affects all domain controllers in TYO site. 1. Still in DC02, launch "Active Directory Sites and Services". 2. Expand "Sites > TYO > Servers > DC02 > NTDS Settings". 5. 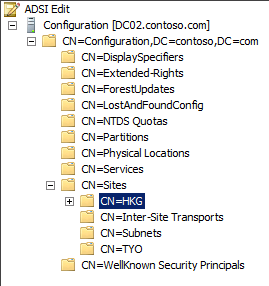 Back to "Active Directory Sites and Services", refresh "NTDS Settings" of "DC02". KCC doesn't generate the inter-site connection in DC02. 6. To restore the setting, go to "Command Prompt", enter "repadmin /siteoptions /site:TYO -IS_INTER_SITE_AUTO_TOPOLOGY_DISABLED". 8. Back to "Active Directory Sites and Services", refresh "NTDS Settings" of DC02. As a result, the inter-site automatic generation of TYO was enabled. Remark: You should create the intra or inter-site connection before disabling KCC's automatic generation. You can modify the KCC's automatic generation by ADSI Edit. 1. At a domain controller, log in as Domain Administrator. 4. 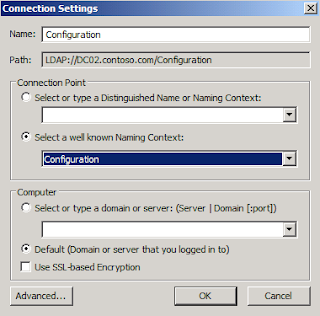 Next to "Select a well known Naming Context", select "Configuration". 6. 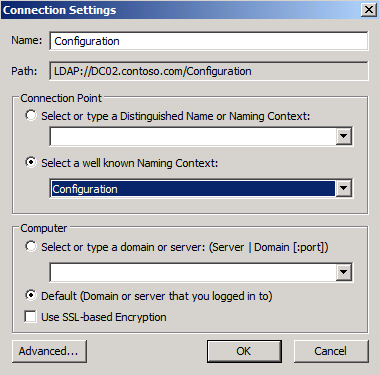 Expand "Configuration > CN=Configuration,DC=<Domain Name>,DC=com > CN=Sites > CN=<Site Name>". 7. 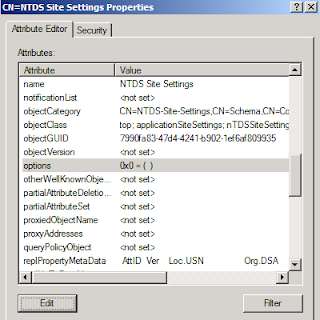 At right pane, right-click "CN=NTDS Site Settings", select "Properties". To disable automatic intra-site topology generation, use value 1 (decimal). To disable automatic inter-site topology generation, use value 16 (decimal). To disable both intra-site and inter-site topology generation, use value 17 (decimal). 11. Type "1", click "OK".